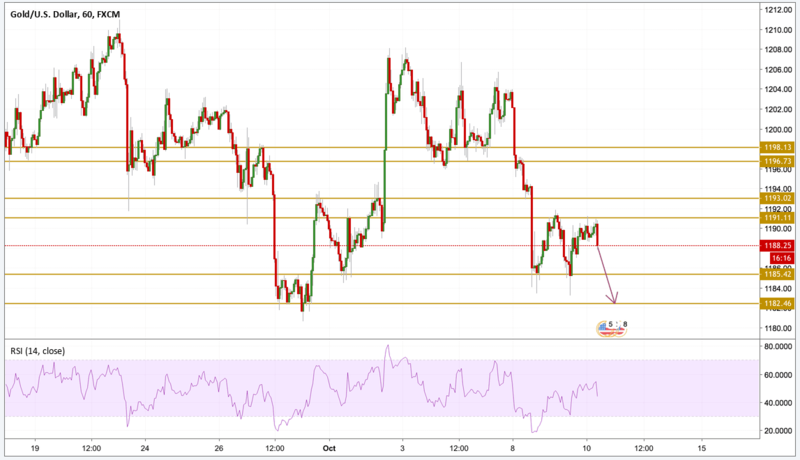 Gold fell to its lowest level since September 28 yesterday and started to retrace its losses in the second half of the day as the greenback failed to preserve its bullish momentum. The Dollar index broke below the 96 level but still it held above the 95.5 level as Dallas Fed President Robert Kaplan stated that he was in favor of three more rate hikes until June 2019. Gold prices gathered some momentum after hitting new lows to climb back above the $1190 level. As of now the yellow metal is pushing lower below the $1188.5 level as the RSI points towards a downward move with a divergence with the price. The next level we will be focusing on is the $1182.5 support level as the prices are most probably ready to print new lows.